Fall in New England is so gorgeous…how can you not love the foliage, mums, pumpkins and of course the apples! Here’s an easy fall look that will take you from the farm-stand to foliage gazing. Rolled-up slim cut jeans start off the casual look. I paired the jeans with a laid-back plaid button down (similar HERE and HERE). Because the days are getting cooler, I added a nylon jacket in an army green (similar HERE). 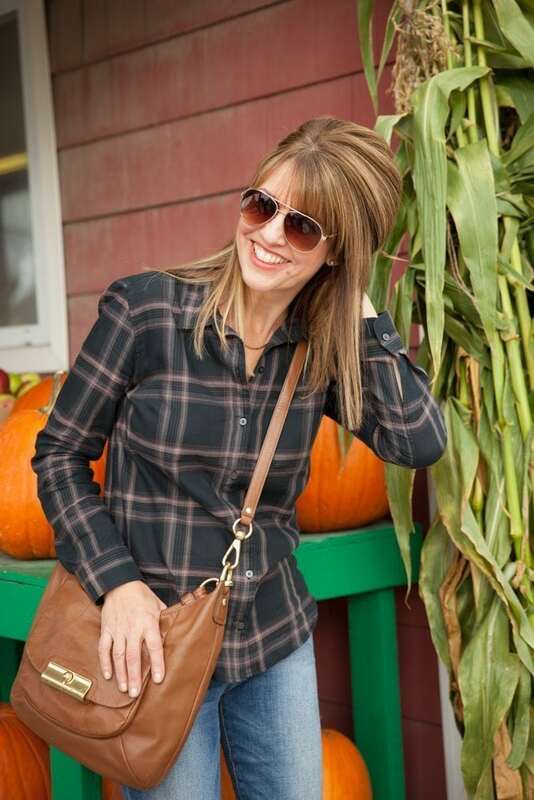 Aviator sunglasses keep the sun out of my eyes and a cognac leather bag (cross-body style) allows for hands-free pumpkin shopping! My bag is ancient, but here are some similar styles that I love HERE and HERE. A simple gold bar necklace, gold stud earrings and neutral oxfords complete the look (love these styles HERE and HERE). And the perfect accessory I can never go without is a special friend to spend the day with. Meet one of my besties Sandi, a 61 year old personal trainer. Is she gorgeous or what? What a great look! Fall is my favourite season. My go to for farm stand shopping is a cashmere sweater paired with the Excursion vest from J. Crew and riding boots with jeans. Love it! Headed to Boston tomorrow! Can’t wait to see a “real” fall season, and to get out of this 90 degree heat in Texas for a few days. I’ve got my plaid shirt and jeans packed! Happy to know I’ll be in style! Mine are old…these are similar though! Thanks for this inspiration! I’d love to see winter outer wear looks.